I have always taken grilling seriously and favor charcoal over gas any day of the week. When we were appartment dwellers years and years ago I picked up a Weber baby Q and now we still use it to this day in the RV. I am thinking of dumping the Q for one of the new Jumbo Joes.....The only thing that has kept me from going with the smokey joe was the size...it was just too small. The Jumbo Joe seems to fit our needs. Plus it weighs less than the baby Q and the stand. I already carry charcol for the dutch oven so why not. I like the conveniance of gas but it can be a pain and you are really limited on how hot you can get the fire, and not to mention cooking indirectly. Forget about it. A majority of my cooking outside is between cooking over the fire (using my The Amazin Grill) or a $20 cheap charcoal grill from Walmart. If the campsite offers a charcoal grill, I'll use that if it's clean instead of my $20 grill (though, opting for over the fire first if I have time to get the fire going- something I'm not terribly good at). The biggest thing that I see about this Jumbo Joe is the size and carrying it between trips. Looks like you're pulling a TT, so the back of the truck is an option. 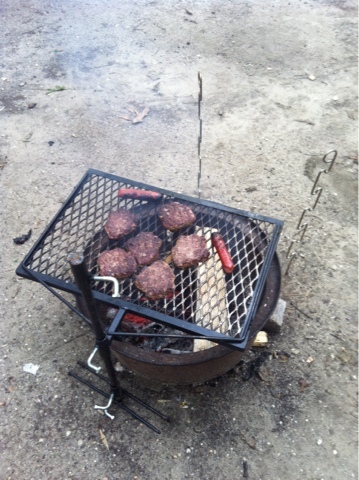 I carry my cheap grill in our fiver's basement. Between being dirty and the space it takes up- I'm looking at alternatives. Take a look at the Char-broil Tru Infrared Grill2Go. http://www.amazon.com/Char-Broil-Infrared-Grill2Go-X200-Grill/dp/B00BFPMLI8/ref=sr_1_2?ie=UTF8&qid=1398873885&sr=8-2&keywords=grill+to+go. It gets hot enough to quickly sear steaks. The infrared system does a great job of indirect cooking without drying out the food, and it never flares up. I have done beef roasts, pork roasts, and turkey breasts with great success. On my full sized version at home, I have even done a whole turkey. My only complaint is that the legs don't fold, so it won't fit in the bin where I prefer to store it. After looking into it.....if the new weber Q specs are the same as my older unit the height of the Jumbo Joe is actually shorter than the existing Q that i use. I also would be able to eliminate the stand and my 5# propane tank that I use. Currently all this takes up roughly 1/2 of my front storage compartment and it all fits through the compartment door. I am going to dig a bit more on this and see what i find. Well I did it... Going to stash the weber q in the garage and will be able to eliminate the stand, 5lb propane tank as well as the grill itself. I know I'll be able to store it and use it, but questioning the ease of gas over coals. I ran a batch of charcoal through it as well as a crappy old skirt steak to give it a little seasoning And burn off any mfg residue. We are ready for some tenderloins at Kansas speedway next week!! We have this grill, along with the clam shell canvas tote that essentially turns it in to a duffel bag for carrying. And, DH was a die hard "it's gotta be charcoal!!!" griller, until he bought this. Dump the gas is right. Here's my next grill purchase. After using the Daniel Boone for 6 months, we love it!